Need a quick and easy last minute gift? Maybe for a friend who likes useful, functional items,...but you want to show off your crocheting skills. 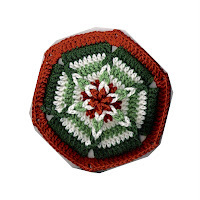 Try these lovely Doily Potholders. 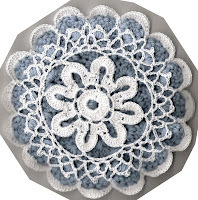 They're from an Annie's Attic leaflet called Quick and Easy Doily Potholders, and are designed by Judy Nelson. I made one in a few hours this afternoon, with supplies I frequently have in my stash, some worsted weight cotton, and some #10 thread. This is part of a Christmas gift, and daughter #2 is thrilled with the results. The second potholder is on the hooks. Now I need to take a break and get some wrapping done. The local guilds will again be Gathering in February in the Harrisburg area. Two years ago I attended my first Gathering, and thoroughly enjoyed seeing the work of the local embroidery, smocking, cross-stitching, lace-making, knitting, and quilting guilds. There was no crochet guild represented. I told myself that I'd work to get the CGOA represented at the next Gathering (2007). Well, Margie & I met and planned, and we got a CGOA Chapter started in Harrisburg in September of 2006. We weren't ready to do all the paperwork, other work and putting out money to be ready for the Gathering, though. But this year our Chapter has a few more members, and we're working hard to be ready for the February 2008 Gathering of the Guilds. This week I'm working on paperwork, first the Lace Makers guild has a booth at the Pennsylvania Farm Show in order to spread the word and raise interest in the Gathering of the Guilds. We'd like to have people demonstrate crocheting at the Farm Show in January. A great way to show off our love of crochet, share our art, get out word about CGOA and our local chapter, and get a nice discount on our Gathering registration fee. We need to gather 2-5 items for display at the booth, have a flyer printed to hand out to interested people, and hopefully, get an ad ready for the brochure. I'm sending out emails, scheduling demonstration times, filling out registration forms, sending out more emails, asking questions, making suggestions, working at the computer with photo imaging programs, publishing programs, etc. I'd like to get all the paperwork finished before heading out of state for Christmas visits. If my trips work the way I'd like, I should be home in time to be ready to teach at Michaels on Friday evening and Sunday afternoon, teach math on Tuesday, and be at the Farm Show several days. Then on to making small items for door prizes, sorting things to display, making a poster & flyers for the Gathering. And don't forget, we need to have a theme for the library display, and gather everything together to put a display in before March 1, March is National Crochet Month. If you're like me, and have fallen in love with the Amazing Star Afghan motifs and their unusual construction, you're in luck. The brochure is in the latest Annie's Attic catalog. Shop online - the brochure is here: "Amazing Star Afghans at Annie's Attic"
I've got 6 or 7 windows open now, just browsing interesting new items in the catalog. I blocked the pineapple doilies, and got them mailed out. Almost immediately I started another pineapple doily. It's the 5-Sided Pineapple Doily in the book Forever Favorite Crochet. This is a classic shells and pineapples design, and it works up quickly. I finished half of it Saturday while watching tv, then did about 8rounds Sunday evening. I worked on a few rounds last night and just have the final rounds of dc and picot to finish. I can't wait to get this one finished and blocked. There's a new yarn shop in town! This weekend is the Grand Opening of Yarn-Love in Hummelstown. I found out about it in an email to our Shawl Ministry, and sent an email out to everyone on our CGOA Chapter list. Four of us met up at the shop at 10:00 this morning. I drive through Hummelstown regularly, so I knew from the map approximately where the store was, but still missed one turn. It's only one street off the main road, though, once you find the store, you won't have any trouble getting there again. It's an easy 20-25 minute drive for me. This will be nice when I want a little something a little better than standard Red Heart, Simply Soft or Homespun. I don't foresee it replacing my current favorite LYS, Knitters' Dream. The shop had a nice selection of wools, beautiful colors, I can't name specific brands because I stayed a healthy arm's length away. They also had a nice selection of non-wools. That's what I look for, quality non-wools. The had some great sock yarns, along with superwash wool blends, including a wool/silk blend, they had a bamoo/elastic blend, and a corn/elastic blend. I fondled quite a few colors before I decided I have too many projects ahead of a pair of crocheted socks. They had the new Borrocco Comfort in worsted weight, and in a DK/Sport weight. If you haven't tried these yarns, cuddle a skein at you LYS, it's a super soft yarn. I was tempted by all the pretty pastels in the worsted weight, but bought only a couple skeins of the DK/Sport as a contrasting neck/button band on the baby sweater. The shop had a good selection of pattern books, and individual patterns, organized by type in 3-ring binders all laid out at a large table with comfy chairs, we had a good time perusing patterns. But,...all the patterns were knit. There were a few crochet books on the bookshelf, but not a great selection. They had a good supply of knitting needles, several brands, including cable and double pointed sock needles. There were only a few crochet hooks, Addi Turbo. The handles looked like they might be helpful for people who have arthritis or other hand troubles, but the hooks had a super short throat, it looked like the yarn would be popping off the hook all the time. Although I felt that crochet was not well represented at the shop, we talked with Pam, the owner and she was crochet-friendly. I asked about bringing in a flyer about the CGOA Chapter and she was very supportive. I think there's potential for improvement in the crochet supplies. They're having an open house the weekend of January 25 - 26, the Chapter is already planning another field trip. If you're in the Harrisburg/Hershey area check out the new shop. Today, the New York Times had a great article on keeping your brain active and functioning into old age. I enjoyed that along with studying a foreign language, designing buildings, writing books, etc. they recommended "knit or perform other mentally challenging tasks". Later in the article the author had this to say "So if you knit, challenge yourself with more than simply stitched scarves. Try a complicated pattern or garment." So I can say that I don't experiment with overlay techniques, Delta crochet, Tunisian, and learning knitting in order to translate patterns into Tunisian simply because of lack of focus. "On average, those who pursued the most leisure activities of an intellectual or social nature had a 38 percent lower risk of developing dementia. The more activities, the lower the risk." Ah, and our weekly crocheting in public, chatting while stitching is helpful, also. The monthly CGOA meeting, the field trips to yarn shops,...that's how I'm keeping my brain active and young! Wow, what's been happening since Thursday? I got a request for some crochet Christmas gifts, so I've been busy. I made two matching, small pineapple doilies, whipped one up Saturday evening, and one Sunday evening. I also made a snowflake motif for the Antique Threadwork motif Crochet-A-Long. Monday and Tuesday are school work days, but this evening I did go to the Sit N Stitch at Michaels. A student of my beginning Tunisian class was working on a swatch that she started on her own. I answered questions and did a little review. She's got some aran yarn and wants to make a Tunisian Simple Stitch baby afghan, and add some cross stitching. We discussed different Tunisian stitches, and taking an advanced beginner class. I may have 2 students in January classes. We also talked about a new Yarn Shop that's opening locally this weekend. We're got a small group planning to go EARLY Saturday morning. The website says they will be offering knitting and crochet classes, so I'm hoping they have some crochet pattern and technique books, and maybe Interweave Crochet magazine. Then I worked on writing out the reverse shaping for a sweater pattern. That's for a crocheter on AllExperts.com. And I talked about the pattern and technique for the Amazing Star motifs. Several people may be purchasing this booklet from my recommendations. I hope to block the motif and doilies tomorrow morning. Then scan and post the motif picture to the Threadwork group. After that I have an idea of another small project to do for a Christmas gift. A poster to the CrochetPartners group is new to crocheting, and is feeling overwhelmed with all the talk about different kinds of hooks. I started to write a reply to the post, and thought that it would be long and a little philosophical, and would make a better blog post. As with an "new to you" hobby, craft, art,...there is a learning period. In the beginning you pick up the supplies that are convenient. When I was just starting in cake decorating, I picked up tips and colors from the grocery story. But as I bought more books on techniques, and spent more time working with the materials I learned a lot more. I learned not only about the quality of the different materials, but what worked best for me. Or maybe what I liked best. Either way, I started researching and finding sources for the materials that I wanted. I also was willing to pay more for what I considered the best materials for the job. The same is true of my crocheting. I don't remember exactly when I started to crochet, or even buying any original materials. But, more recently (10 years ago?) I discovered that I often picked up a hook and started a swatch, didn't like the results and process. I would put down that hook and select a different hook and be more satisfied with the results. I then discovered that I had a collection of Bates hooks (inline) and Boye hooks (tapered), and I was never happy using the Bates hooks. I made a list of the hook sizes that I needed to replace with Boye hooks, and went shopping. I was willing to go to several stores until I found the brand that I wanted. No more buying any old hook just because it was the right size. About 3 years ago I thought that I'd try some wooden hooks, because people on the Crochet Partners list were exclaiming over the wonderful Brittany hooks. They are now making them in a light wood only (birch), not the darker wood (black walnut). So when a Black Walnut Brittany hook came up on eBay for a reasonable starting bid, I went for it, and won the auction. I found that I really don't like the Brittany hooks, they have that inline design that just doesn't work for me. But I did like the wood, they're light, slide easily through the yarn, and are aesthetically pleasing. So, I've purchase more wooden hooks and found that I don't like the Vermont Made, aesthetically pleasing !! but top heavy. I do love the Sonshapes hooks, they have a tapered head, the balance of the hook is good, and they are super smooth. At this point in my crocheting life, I am willing to spend time searching out the Sonshapes hooks, and paying good money for one, rather than going into Michaels or AC Moore and paying $1.50 or $2 for an aluminum hook. Now don't get me wrong, I have a complete set of aluminum hooks, from B through N, with at least 2 of the ones I use the most; and at least 3 G's because one is a G7. But I also have about a dozen Sonshapes hooks, about 5 unused wooden hooks of various brands, and 3 of the new lighted hooks. I also have an almost complete set of steel hooks for thread work, from 00 down to 13, with about four #7s because that's what I use most. Similarly, I used to grab any old thread from JoAnn's, Michaels, in the early years K-Mart and Woolworth. After many years, and many, many projects, I've decided that I just can't stand to work with South Maid thread. It splits, has no shine, feels like straw, and I don't like the look of the completed project. If I'm going to spend days or weeks on a doily, runner or table topper, I'd hate to have it look like trash when I'm finished. I recently when through some stacks of projects and threw away two fairly large projects, they just didn't have the quality to make them worth taking up space. So A Hook is a Hook, but I won't buy just any hook. When I go shopping I want to buy not only a hook, but The Hook. Yesterday, I met up with two fellow yarnies from our CGOA Chapter. We met at Starbucks, and after fortifying ourselves with Peppermint Mochas and Cranberry Bliss bars, we piled into my van and I drove to our local yarn shop (lys). This shop requires a trip "over the river and through the woods". No, that's grandma's house. But we do have to get on the back roads, drive through the farm land, then through the golf course, and up the side of the mountain. I didn't need any new yarn, but then it's not usually a matter of need! I recently bought some boucle online at $2 per ball (to be used for Shawl Ministry). And bought some Simply Soft for a baby afghan design, and several skeins of Red Heart for swatching and Warm Up America squares. So, instead of starting with the yarn I started with books and patterns. Do I really need more of those? I fell in love with a new book of afghan patterns, though. Wait, all the patterns were knitted! Somehow I felt the designs and colors were inspiring, and found several stitch patterns that I wanted to try in knitting, just so that I could then try them in Tunisian! It was 50 percent off with any purchase! And I did have a $5 gift certificate, I had to do some looking at yarns, also. I looked, touched, got ideas,...all touching is done with the help of my personal "woolie boolie". This personal assistant reads labels, verifies wool or no wool, and tells me whether I can touch them safely. Remember, I was the designated driver. If I touch the wool and the eyes start itching and watering, and the nose starts running; who's going to drive us home? I then discovered some yummy baby yarns, I do need to make a layette for a spring baby. I selected a Peter Pan in white with pink, blue, yellow, green, peach, and lilac. I also liked the Plymouth Dreambaby Kokonut. I bought two different balls of that to make little hats for charity. I just showed it to daughter #1, she said "it reminds me of that colored coconut", then I showed her the label. Today I looked through several books and my 3-ring binder of baby patterns and selected a pattern for a sweater and hat that's very gender-neutral. I wanted a pattern that also had booties and a blanket, but most were too girly. That's okay if the baby turns out to be a girl, but at this point I don't know. I figured that I can either find a bootie pattern (I definitely have plenty of those), or that I can adjust so that it goes with the sweater. I started on the sweater while watching tv, and I've completed the body, left front and most of the back. Really good start. I may move on to the hat and booties before doing the button band, because I'd like to pick out the buttons first, and then make the buttonholes to fit the buttons. Tomorrow's weather doesn't look promising for a short trip out to look for buttons. Hmmm, maybe an internet search for fun buttons.